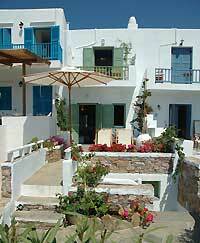 Glaros House is a beautiful independent semi-detached house built in 2005 in a traditional style. Located directly on the waterfront of Platy Yialos beach. The veranda of the house is directly on the beach. The quality of this house in conjunction with its location makes it an ideal vacation home. The décor and furniture are quite nice with built-in living room furniture, tasteful and comfortable. The veranda is equipped with comfortable veranda tables and chairs as well as chaise lounges. The ground floor is inlaid with traditional flagstones, the upper floor is wooden. All the house rooms have air-conditioning; there is one TV in the living room and one in the main bedroom. There is also a washing machine and a dishwasher. The house is built in 3 levels and is suitable for up to 6 persons. On the ground floor there is the spacious living room with a dining area and fire place, a fully equipped kitchen, a bathroom and a veranda with panoramic view of the sea, the beach and bay of Platy Yialos. An interior wooden staircase leads to the upper floor on which there is the master bedroom with a double bed, a sitting room, also used as a bedroom with 2 built-in sofa beds in an “ L ” shape (suitable mostly for children and teenagers), one more bathroom and a balcony (accessible from the master bedroom) offering the same panoramic views as the ground floor veranda. An exterior staircase (from the ground level veranda) leads to the house’s underground level - the house cellar, in which there is one more bedroom with 2 single beds, an equipped kitchenette and a bathroom. The cellar is also air-conditioned and equipped with a TV and it has its own individual entrance, and it is suitable for children privacy or for one’s support personnel. The sea side tavernas and bars, the shops and bus stop of Platy Yialos are all nearby. Free Wi-Fi Internet is also available.